'Sweet, frothy and fluffy bubbles that smell like custard creams. What a delight it is to have a bath in the equivalent of a cup of vanilla flavoured, frothy, hot chocolate topped with marshmallows. The Creamy Candy bath is like the friend you're always delighted to see, because he bubbles over with cheerfulness no matter what life throws at him. For days when your friend is busy, it's time to indulge in some Creamy Candy'. • None that i can think of! Hold the bubble bar under running hot water and crumble in between your fingers until you have used the piece up. You will then have lots of long, lasting bubbles & a nice pink bath! Would i buy this again: Absolutely! I have already repurchased this a few times as it is one of my lush favourites! I love all things pink, girly & sweet smelling so this is perfect for me! 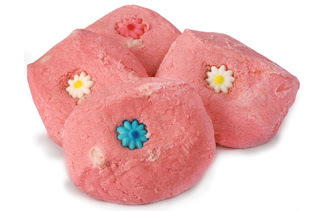 Had a gorgeous scent, with lots of bubbles, perfect for a nice & relaxing bath! Which lush products would you recommend? Aw I want to try it, might get it for the BF since I can't have baths and live vicariously through his bubble bath obsession! Have you tried the pink and white swirly one? He had one yesterday in the bath and loved it. I will definitely try and get one of these - the description sounds just like something i'd like to try! I am coming back to the UK in a couple of wks and Lush is going to be one of my big stops for beauty stuff - will add this to my list! I always smell this in the shop but never end up buying it !